The National Association of Community Health Center’s (NACHC’s) Quality Center supports the advancement of health center quality, improved outcomes, and lower costs. The Center’s innovative team brings together NACHC’s clinical and quality initiatives under a unified umbrella. We are improvement specialists who define our success as the ability to transform health center systems in ways that create positive impact. Learn more about the Quality Center. 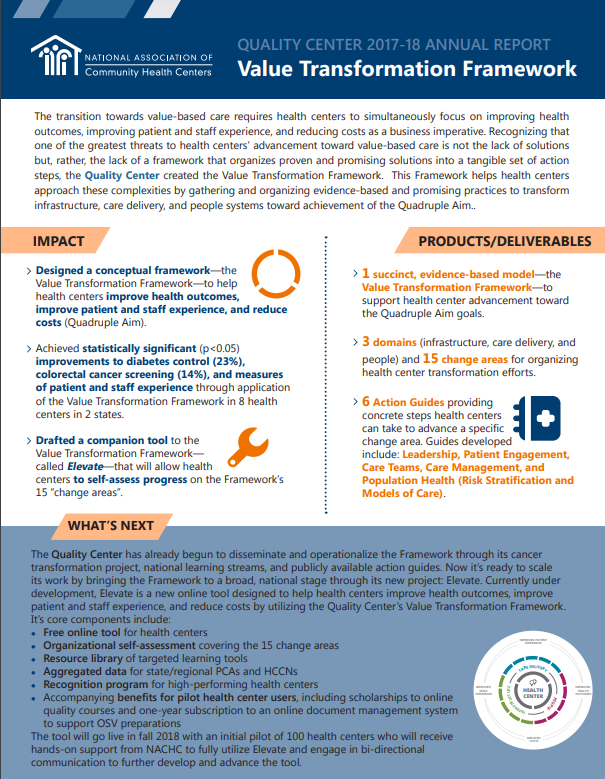 The Elevate tool is a national learning forum and companion tool to the Value Transformation Framework that helps health centers transform systems to deliver better care at lower cost. Be part of the first cohort of 100 health centers and receive early access to the tool, year-long transformation support and training, and additional benefits. To learn more, download the Elevate flyer and FAQs. You may also view a recorded informational session on MyNACHC by logging in and opening the recording and supplemental materials. QI Touchpoints is a national virtual network of individuals working on the front-lines of health center QI that serves as a vital bi-directional resource to the Quality Center for quality-related issues. PCA, HCCN, or health center staff interested in joining this network can fill out the registration form. The SDLE is a professional development tool for QI coaches at the PCA & HCCN level. The SDLE is based on the domains and change areas of the Value Transformation Framework and allows QI coaches to self-assess their strengths and weaknesses as well as directs them to resources to address their skill gaps. Currently, the Quality Center holds bi-annual enrollment periods for the tool. Email qualitycenter@nachc.org to find out when the next enrollment period is. NACHC offers opportunities for health center and PCA/HCCN staff to discuss issues that are important to them. HCCN staff supporting their efforts, to discuss ways to leverage leadership’s role in transforming the health center to advance the Quadruple Aim goals of improved health outcomes, improved patient and staff experience, and reduced costs. Recordings of the 2018 Leadership Learning Stream series are available on MyNACHC. managers, and PCA/HCCN staff supporting their efforts, to discuss building care management models, including processes that support reimbursement for Centers for Medicare and Medicaid Services’ chronic care management services. Recordings of the 2018 Care Management Learning Stream are available on MyNACHC. Questions? Contact us at qualitycenter@nachc.org.